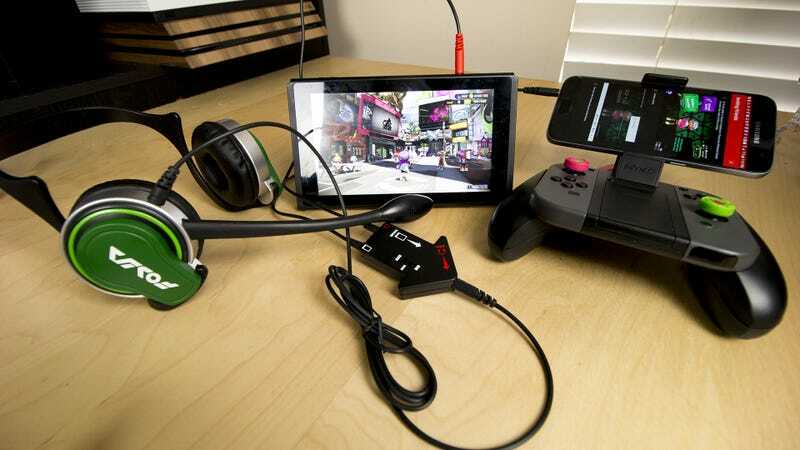 Pictured: Hori’s official Splatoon Headset and Nyko’s Clip Power Grip, which sadly is stuck in landscape mode. More on those optional bits later. The Nintendo Switch online app is live for Android and Apple devices. It offers some Splatoon 2 utilities that let players to keep track of their stats or buy special in-game items, which is pretty neat. It’s just not a very elegant solution for online voice chat between friends. In order to communicate with friends over voice in Splatoon 2 (and only friends, as is Nintendo’s way), each friend will need to have the Nintendo Online app downloaded and running on their phone or tablet. Players will need a communication headset of some sort plugged into their phone. If they want to hear game sounds and chat, they’ll either need a one-sided headset, or a splitter like the one that comes with Hori’s adorable licensed headset. You can buy awesome glasses from the app, so there is that. One of the players in your group must then go into Splatoon 2's multiplayer section and create a private room via the Online Lounge section, sending out invitations to each friend they want to chat with. Invitations can also be sent through the app directly Once an invitation is accepted, friend icons show up on a screen in the mobile app. When I tested the app with Patricia Hernandez, I found the chatting itself to be fine. I would have loved to see more control over voice volume within the app than a single mute button—all volume functions are handled by the phone or headset the player is using—but it worked well enough. Until we started playing. The Online Lounge mode only allows for private games between people present in the lounge. Voice chat will also work in League Battles, Splatfest battles and Salmon Run co-op. Ranked games and basic multiplayer battles are excluded. Another limitation is that once teams are selected, the voice channels switch to team communication only. As soon as we started a 1-on-1 match, we could no longer hear each other until the match was complete. If I use my smart device’s other features (texts, social media, etc.) will I be disconnected? The voice chat will disconnect while you’re talking on the phone or using another application, but your voice chat will restart in the same room once you open the Nintendo Switch Online application again as long as the game session is still ongoing. It’s better than nothing, but not much better? It would be just as easy for players to call each other on Skype or Teamspeak or whatever they did when they played the original, completely voice-less Splatoon. If we’re going to require external hardware, might as well have full-featured software to go along with it. I’m not seeing it yet, but it’s still early. Maybe jumping through all of these hoops will be worthwhile, eventually. Just not today.